I want to waffle on a little bit more about Siena. I’ll start by explaining something that I didn’t quite understand yesterday. 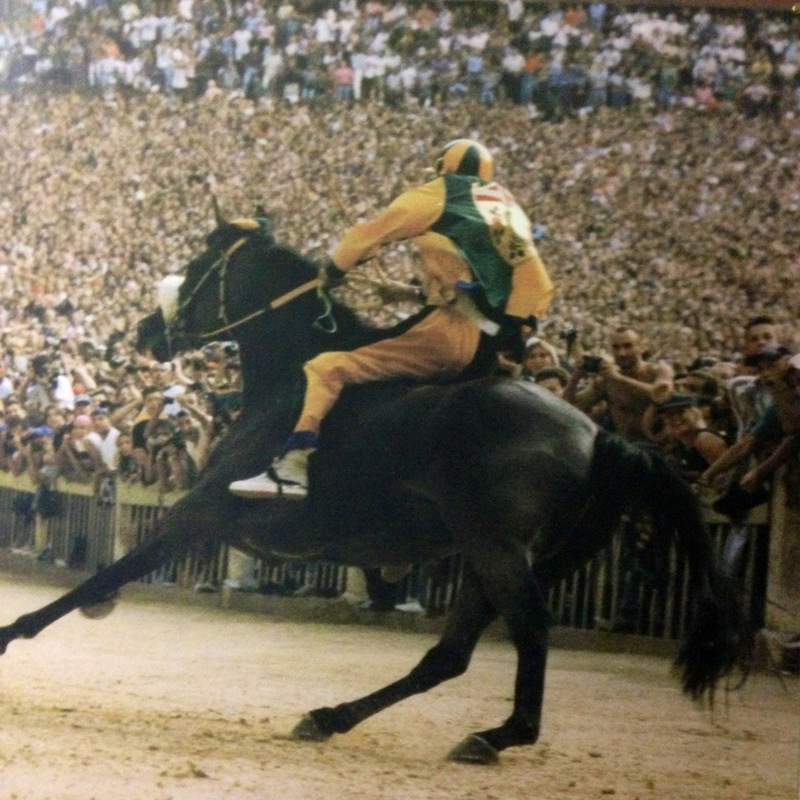 It became obvious to us that at some time there was or is a race that takes place in the Piazza del Compo as there were many pictures of this race to be found all over the town. While we were walking in Siena, we heard drums and later people walking with them singing, with a band following behind. As yesterday was quite a chaotic day in the Italian calendar, we assumed it was to do with either Corpus Christi or perhaps the anniversary of the Republic, but there was a lot of flag bearing and what puzzled me most was the giraffe emblem on the flag. I am still at a loss to imagine a giraffe in Siena, but at least I now understand what was going on. 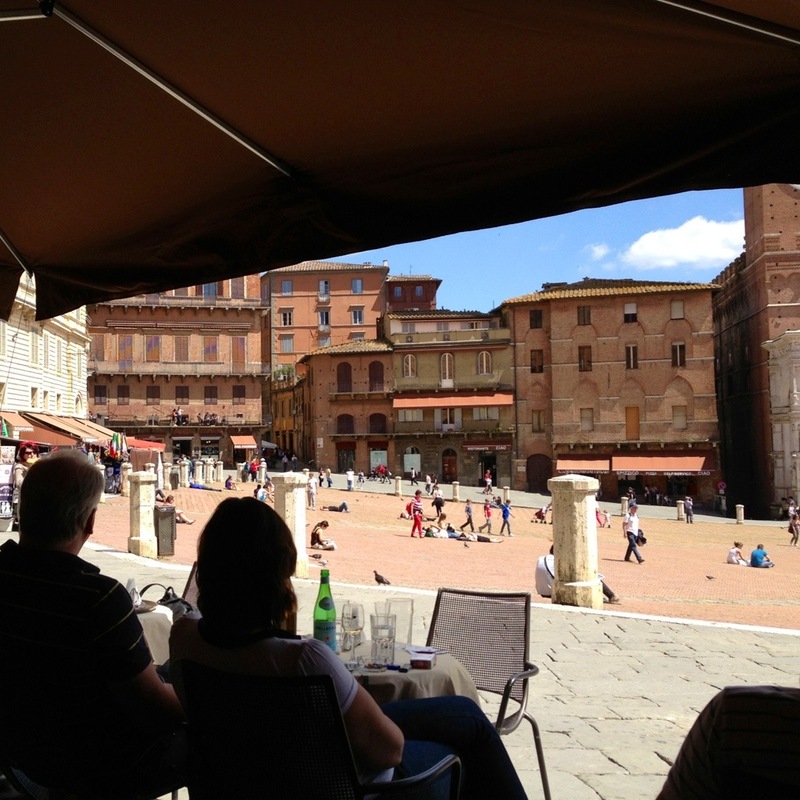 There are 17 areas of Siena, called contrades, and each have a name and they are very clannish and competitive. They are each allowed one horse and a jockey of their choosing in the race, who rides bare backed. In the days and weeks before the race each clan marches about, singing and flag waving to drum up support for their team. And yesterday it was the turn of the giraffes. It says in Wikipedia (so it must be right) that the worldly use conventional means of bribery and corruption to win, while the more noble just keep an eye on their horses and jockeys. So it is full of true Italian tradition! The day itself is a highly charged affair and once the town is full, it is closed to visitors. It is a massive pageant with many entertainments to see, but the high point is the race itself. It is only three laps of the Campo, but it is started with a display by the Carabinieri on horseback, trotting, then charging full speed. Then the race begins with the one horse coming out last as the starter for the race. There are many deals done about where and when this horse comes out and many tactics involving position and timing. And then they are off! There are no rules in this race, the object is to win and gentlemen do not race in this event! The rivalry between the contrades is so great that just to beat your annoying neighbour is an achievement, and there are often fights after the race in the Campo. The winner is given a silk scarf or Palio designed specifically for the race by a local artist, so you win purely for the prestige. Now having been in the Campo, which is a natural bowl, imagining what such an event is like is quite terrifying, as there would be no way out once in and no room to move until it is finished. I might like to sit on one of the balconies and watch from above, but I can never see myself in the middle of that! Truly though it would be an amazing spectacle. 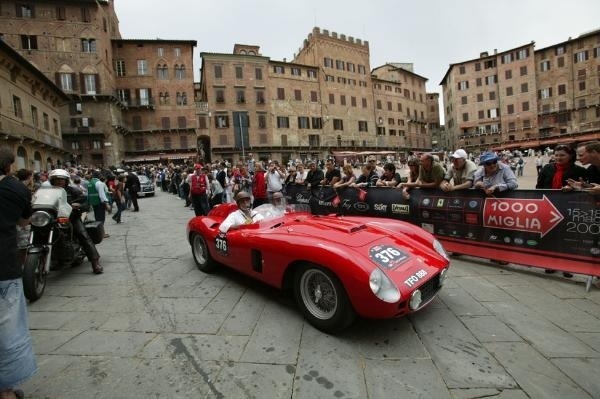 For us though, seeing the cars of the Mille Miglia parade through this Piazza would be a dream come true!